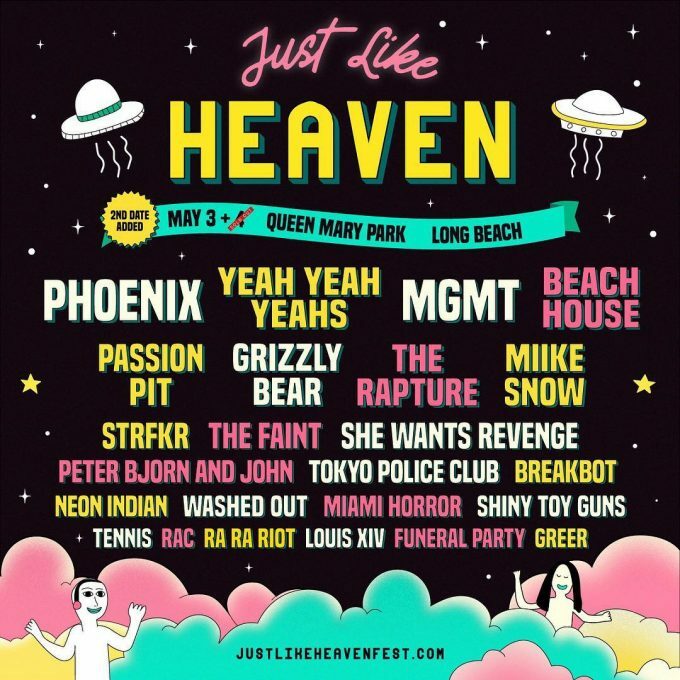 Just Like Heaven was originally booked as a single-day affair for Saturday, May 4, with Phoenix, Yeah Yeah Yeahs, MGMT, and Beach House at the top of the bill. However, the enthusiasm for the lineup’s heavenly headliners and rock-solid undercards such as Grizzly Bear, Passion Pit, and The Rapture, reached such a level that a few changes have been deemed necessary. There is something mystical about how a song can take you back to a memory, good or bad, that was made 10 years ago, 20 years ago, or maybe even further. So upon the unveiling of the Just Like Heaven lineup, the nostalgia factor for many festivalgoers was just too strong to ignore. Case in point: the festival was sold clean out the same morning that tickets were first made available. In fact, early-bird tickets priced at $99+ fees, sold out quicker than a (spoiler alert) Thanos finger snap. Much like moviegoers who found themselves upset about the Marvel villain’s victory over the Avengers, music fans weren’t exactly pleased about not getting any tickets at all. To be held at Queen Mary Events Park in Long Beach, CA, Just Like Heaven is a production of Goldenvoice, the same live music producer responsible for the juggernaut that is the Coachella Valley Music and Arts Festival. Similar to Coachella, Goldenvoice’s solution to help satisfy demand for its Long Beach festival was to add a second date on Friday, May 3. At this point, there’s no doubt that the carefully crafted Just Like Heaven lineup inspires a warm and fuzzy feeling for festivalgoers. Is it simply treasured musical acts of a different era all in a single space? After all, if this were Coachella 2009 or 2010, the four headliners would have been targeted to perform either on the Coachella Stage or Outdoor Theatre Stage. Is it the fact that it’s only a single day event, and not a three or four day marathon? Perhaps it’s a mix of each of these, and that’s why Goldenvoice named the festival what it named it. Heaven arrives in Long Beach on May 3 and 4.